Hand and wrist injuries tend to plague even the most experience winter sports enthusiast. A fall on the slopes, the ice rink or the cross-country track can put vulnerable thumbs and wrists at risk. Here are some common injury causes and treatments. Plus a few preventative measures that will hopefully keep you on the snow and out of the doctor’s office. Sometimes called Skier’s thumb this injury happens when the ski pole does not release form the hand during a fall. The pole places a stress on the thumb which can cause a thumb ligament to tear. If you have taken a fall while skiing and have pain in your inner thumb, you should seek treatment from a hand specialist. Only a specialist can determine whether the pain is caused by a partial or complete ligament tear. Treatment for Skier’s thumb varies. A partial tear can be treated with a cast or splint; however, a complete tear should be treated with surgery to repair the ligament. Recovery time can be between 6-8 weeks for the occasional skier. Professional skiers can discuss options with a hand specialist to speed recovery. There are measures skiers can take to prevent injury. If you do fall, immediately release your ski poles. Also, choose a ski pole without platforms or saber handles to decrease your chance of injury. Wrist injuries can occur when the hands reach out to prevent a fall. 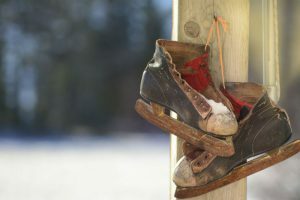 This can happen during skiing, snowboarding, ice skating or any activity on a slippery surface. The forceful pressure placed on the wrist upon impact can cause injury to the wrist’s bones and ligaments. Studies show there is an increased risk of wrist injury to snowboarders for one reason, both feet are rigidly fixed to the board. Which means, when a backward fall occurs they will reflexively put out their hands to prevent hitting their head on the ground. If you experience wrist pain after a fall, you should see your doctor. You may need a thorough exam from a hand specialist that includes x-rays, MRI or CT scan. Treatment for wrist injuries can include a splint, cast or surgery. Recovery time could be between 4-12 weeks depending on the severity of the injury. Many injuries occur with fatigue. If you feel tired, take a break or stop for the day. Wear protective gear. Everyone should wear helmets and snowboarders can wear wrist guards or specialized gloves with wrist guards. Skis and snowboards have sharp edges so try to avoid those if you fall. Dress appropriately and be aware of potential frostbite. Early stages of frostbite will show in the fingers as becoming white, numb and swollen. Take note of warnings posted by the mountain on very cold days. Have your gear tested, set and tuned by professionals. Watch out for other skiers and snowboards while on the mountain. Proper etiquette states that the person below you has the right of way. Stay within your abilities. Avoid steep slopes or the terrain park if you do not have sufficient experience. If you are a competitor, avoid unnecessary risk prior to an upcoming event. Snow sports are fun, but safety should be taken seriously. If you suspect you have a thumb or wrist injury or for more information, please visit heidenortho.com or call 435-615-8822.